Looking for new granite countertops? Marble vanity tops? Chisel Marble & Granite is a fabricator and installer of granite, marble, and other natural stones that come from the most exotic locations in the world. We also offer Green / LEED products. The rich palette of colors, combined with the many textures now available in natural stone is making it an increasingly attractive choice for architects, designers, and homeowners today. Our attention to detail is second to none. Our fabrication process combines an artisan's touch with the most advanced technology available today, providing the opportunity to offer consistent quality, versatility, and timeliness. Chisel Marble & Granite offers its clients the freedom to be as creative as they wish. 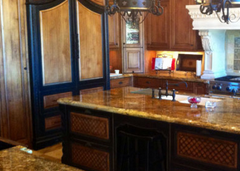 Our highly skilled craftsmen produce custom countertop edges within a wide range of slab and tile applications. Samples of our innovative designs and applications can be viewed in our showroom at the Scottsdale Design Center. We have a passion for rare and exotic stones, and are committed to fabricating the most cutting edge stones available in the global market today. We are committed to enhancing our clients' experience and exceeding expectations in working with our firm. We realize that our business is only as good as our reputation. We continue to work diligently at delighting our customers, with the result that the majority of our business comes from referrals. Material selection : Granite, Marble, Travertine, Limestone, Onyx, Ice Stone ( a green/LEED product), Quartz Surfaces - Caserstone and Silestone, Ceramic, Glass, Porcelain, and Mosaic Tiles. We also offer a full line of Natural Stone Care Products. Visit our website for your free Stone and Tile Care Guide. We have a Full line of care products and a Stone Care Guide for proper maintenance of newly installed countertops, table tops, vanities, etc.